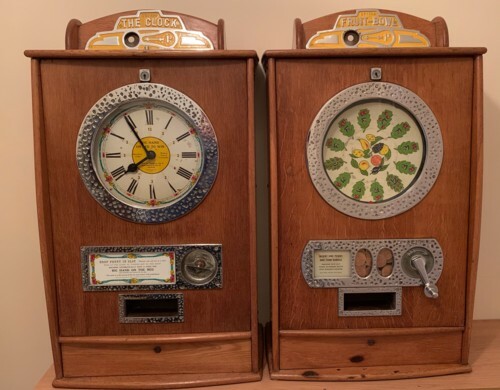 Bryans Spinning Games, Bullion, Clock, Fruit Bowl, etc. Bryan devised a number of spinning games of different forms. These were basically gambling games, although on the Bullion it was possible to place bets on the outcome, which made it more interactive. 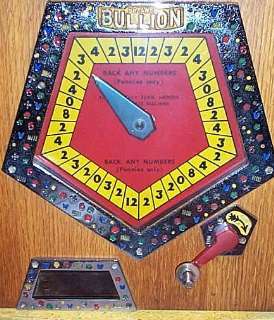 Compared to the more common One-Arm Bandit, these games only had a single spinning disc; so they lack the element of suspense that the Bandit has, where each reel stops in turn. 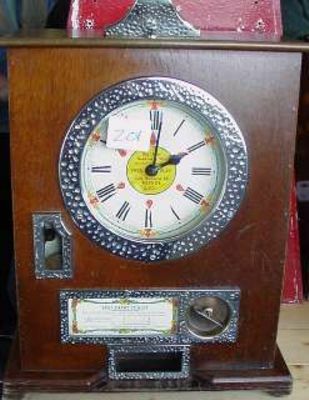 However, the Clocks were sold in very large quantities, and the public probably thought that they had a greater chance of lining up a single disc than three spinning reels. 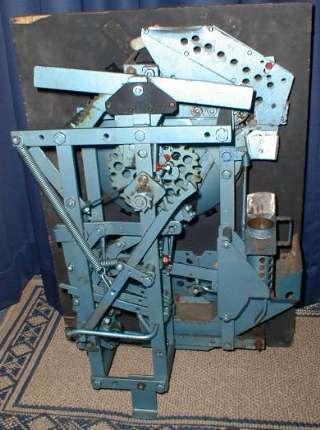 It is also reported that the authorities were initially fooled by the machine, thinking that it was a real clock! I wouldn't have thought that they were fooled for very long! The same as the 6-Win version, but with a payout on every hour. 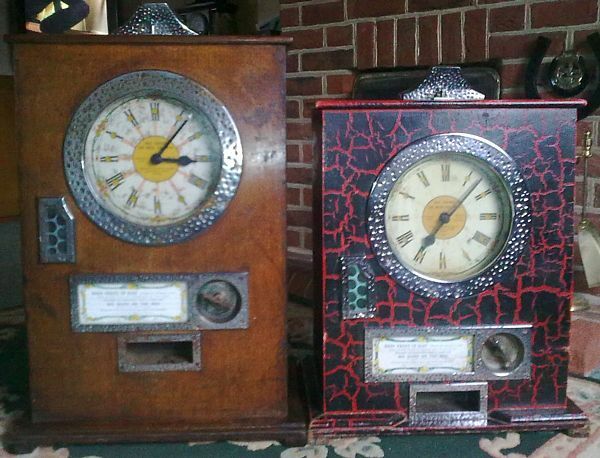 The Clocks were extremely common, and were made in large quantities, and a number of different case styles. 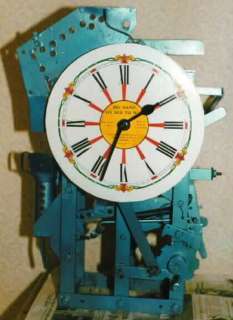 Later Clocks had a separate lockable cash compartment at the bottom of the machine, accessible from the rear. This necessitated a taller case, and the difference between the two versions is obvious from this photograph. It is believed that this was a feature added in the 60's, possibly to prevent the maintenance man having access to the cash box? 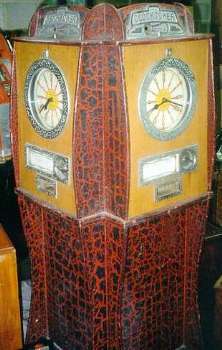 It seems strange that the cash box door was at the back though, when most machines had the door at the front. Not very convenient to have to heave the machine around to empty the cash box, especially if you had a whole row of them to empty! 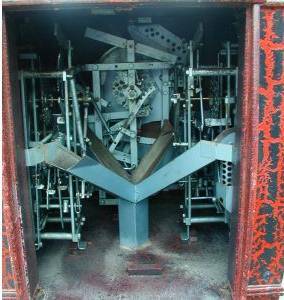 Gerry has offered a convincing explanation for the cash box doors being at the back: "The arcade and fairground operators used to set up the areas for the machines in square blocks with machines mounted with their backs into bays, they had corridors all the way round and a (locked!) access door in between. 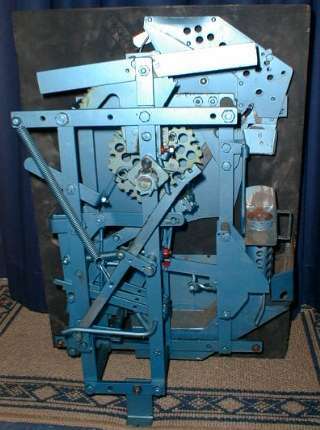 This was to allow the 'bag man' to access the machines for emptying/refilling jackpots and tubes without interfering with valuable play time. I can recollect on several occasions playing a machine at the front while some mystery fingers were scrabbling around in the rear of the machine at the same time. Prior to this innovation the bag man had to enter the arcade, take the machine out of service, turn it round, empty it in full view of a resentful public (bloody hell! look how much cash he's taking out of that!) and risk giving people ideas about robbing him. So all for good reson then, security and profit. You only have to look at what now happens in Vegas when you drop a coin or a bill in a slot to see where the basic idea ended up. Now that's what I call progress!" 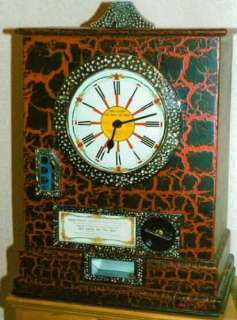 12-Win Clock and mechanism in the rarer crackle finish case. (photos courtesy S.Parkes). 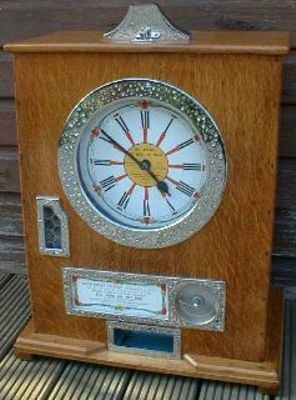 12-Win Clock and Fruit Bowl in matching streamline cases. These have serial Nos. 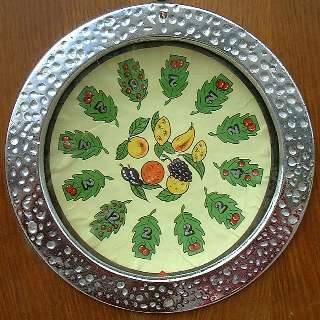 162 (Fruit Bowl) and 2162 (Clock). It is thought that they were bought from the factory as a pair and have been kept together from new. 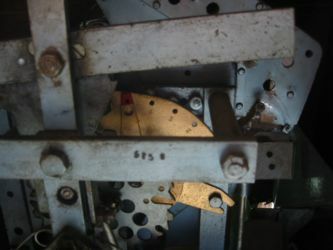 Below: Mechanisms of the Clock (left) and Fruit Bowl (right). 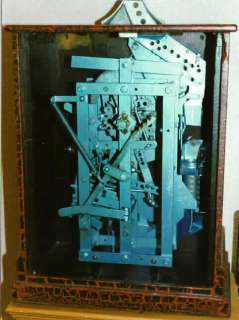 The mechanism of the later Clocks was almost identical to the Fruit Bowl, as can be seen from these photos. 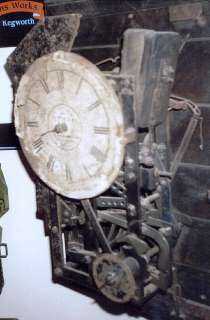 Earlier versions of the Clock used a slightly different mechanism (see photo above). 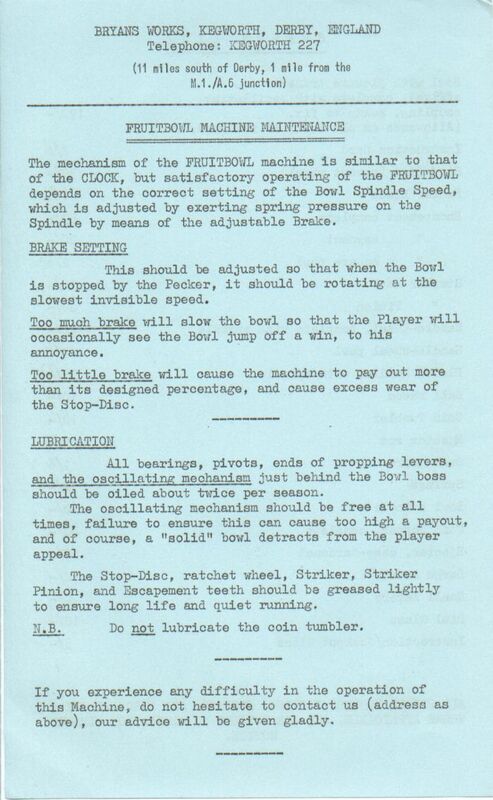 On inserting a penny and turning the key, the windmill slowly rotates. The player presses a knob on the front of the game, in an attempt to drop a pointer onto the edge of the sails as they rotate. If the pointer lands in one of the notches on the sails, he is rewarded with a payout. The payout is the same for all notches, and can be set to any amount from 1 to 18 pennies. 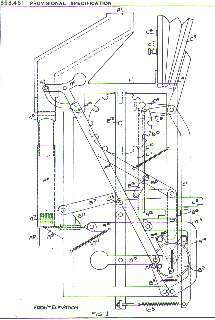 The mechanism was unusual in that it used a fluid flywheel, rather than the usual escapement device, to drive the windmill sails at a slow and constant speed. 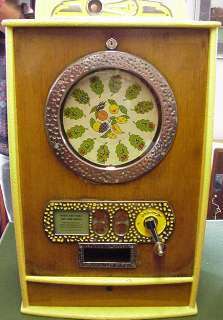 The Fruit Bowl was a simple gambling game (gambling machines had been legalised in Britain in 1960). 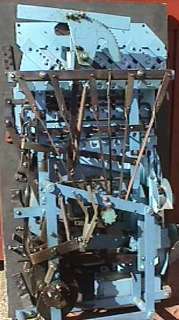 Rotation of the handle would spin the dial, and the machine would pay out 2, 4, 6 or 12 coins, if the numbered symbols lined up with the pointer at the bottom. The jackpot on the front is a dummy. The pennies are there merely to attract the punters! 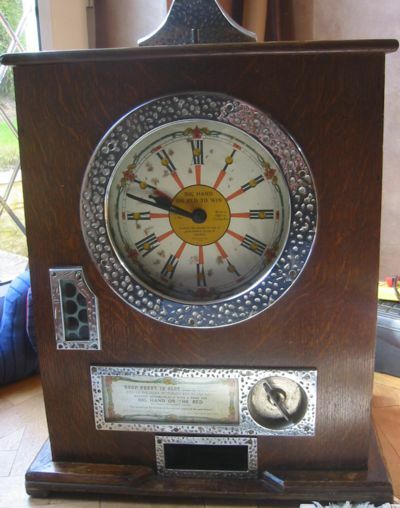 The Bullion was a gambling game in which you could actually place bets upon where you thought the pointer would come to rest, effectively a mechanical Roulette. 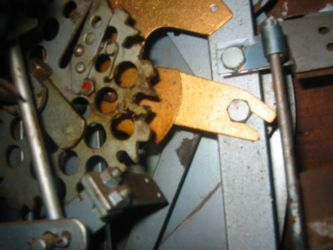 A coin would be placed in the chosen slot at the top of the machine, and the handle turned. 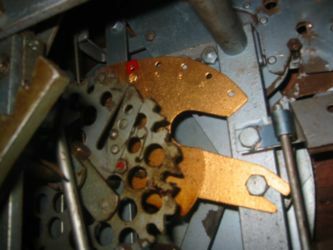 This wound up the mechanism and set the pointer spinning. When the pointer came to rest, the machine would pay out the value of the bet if you chose the winning number. You could insert coins into more than one slot in the same game, so multiple bets could be placed. 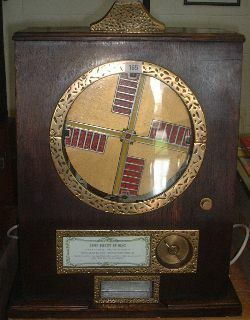 The windows above the dial were used to store and display the coins during the game, so that the player could see which numbers had been bet on. 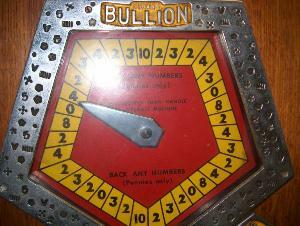 The Bullion was a very popular game, although it wouldn't score any points for attractiveness! The Bullion exists in old penny (1d) and new penny (1p) versions. The decimal version can be recognised by the five smaller coin entries, and white paper labels stuck over the '12's to convert them into '10's. 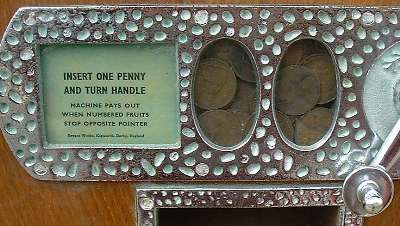 Unfortunately, the size of the coin windows was not changed, which makes it difficult to see the small 1p coins in the windows designed for the old penny. 2p versions are known, but they are rare. 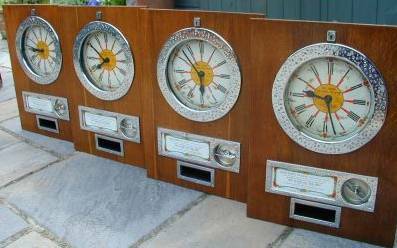 Until recently it was thought that all new Bullions supplied after decimalisation still used the old '12' dials with white paper '10' labels stuck over them, and no new dials were ever printed. Then this example came to light. 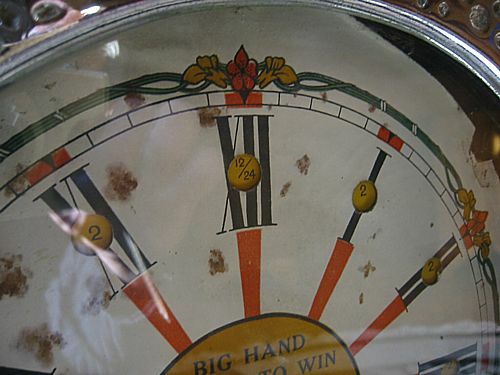 New dials must have been printed very late in the Bullion's career. A new printed dial has also been seen on a late 2p Bullion. 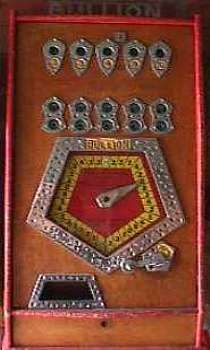 The mechanism of the Bullion. Another feast of Bryans mechanicals! 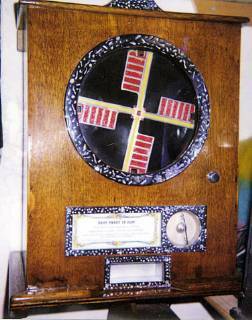 This game was purely mechanical - a considerable achievement for a roulette game of this type, with multiple automatic payouts. 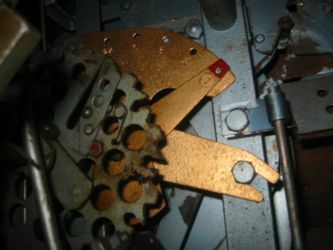 The toothed segment at the top engages with the rocking bar above it, which provides for a timed run-down of the mechanism. 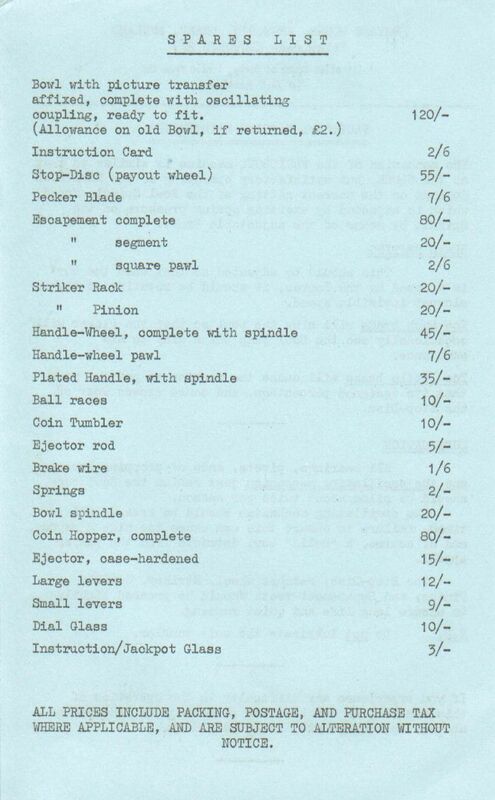 The Bullion was Bryan's last great mechanical contraption!